Ice Hockey has a complete set of rules that make it a very different game than any other sport. The rules are designed to provide a safe and positive playing environment while promoting skill development and a passion for the game of hockey. This page is designed to provide an overview on the most common rules and infractions seen in hockey. For a more in depth look, check out USA Hockey's Mobile Rulebook. Face-Offs: This is the method by which the puck is put into play. 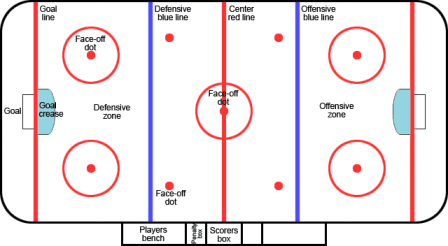 During a face-off, one player from each team lines up to face each other at one of the rink's nine face-off spots. The referee or linesman drops the puck between the players, who then battle for possession. Offsides: This occurs when a player enters the offensive zone before the puck. It results in a stoppage of play and neutral zone faceoff. Icing: When a defending player sends the puck, untouched, from behind the center red line across the opposing team's goal line in the offensive zone. This results in a stoppage of play and a faceoff in the offending team's defensive zone. Hand Pass: Players in hockey are not allowed to play the puck with their hand outside of their defensive zone. When a player moves the puck to a teammate with his hand, the official blows the whistle, and there is a faceoff at the position where the puck was passed from. At no time can players close their hand on the puck. High Stick: When the puck is played out of mid-air by a player whose stick is above shoulder height and a teammate is the next to touch the puck, a high stick infraction is called, resulting in a face off in that team's defensive zone. Tripping: Player uses stick, arm, or leg to take an opponent's feet out from under them. Slashing: The act of swinging a player's stick at an opponent, whether contact is made or not. Major Penalties: Major penalties are assessed for many of the same infractions that apply to minor penalties except they involve a greater degree of deliberate violence that can result in injury. The player who is serving the five-minute major must stay in the penalty box for the full five minute penalty time, regardless if a goal is scored on the "shorthanded" team.